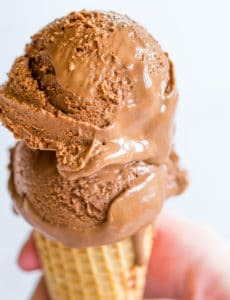 When I asked my Chief Culinary Consultant last week if he had any ideas for new ice cream flavors since I still had two more Fridays left for celebrating July’s National Ice Cream Month, he offered up quite a few great ones, but the one we both got excited about was spumoni. I haven’t had spumoni since I was much younger, and was excited to tackle this traditional Italian frozen dessert. Little did I know when I decided to make this that in addition to another baking project I would also be tackling a research project. There was much to learn about spumoni! I wanted to make it as authentic as possible, so I went about reading everything I could find both online and in the cookbooks I own. 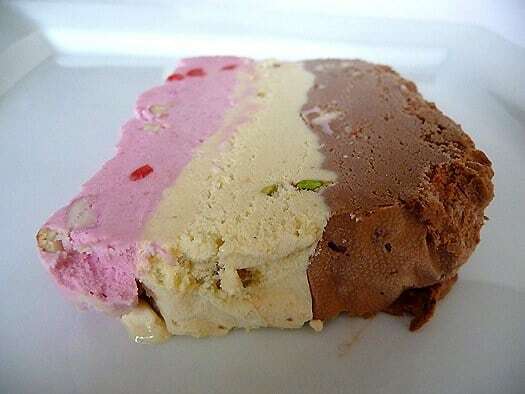 Spumoni, known in Italy as Spumone, is a molded Italian ice cream made with layers of different colors and flavors, and containing a variety of fruits and nuts. The most traditional flavors are chocolate, pistachio and cherry with various nuts and fruit. 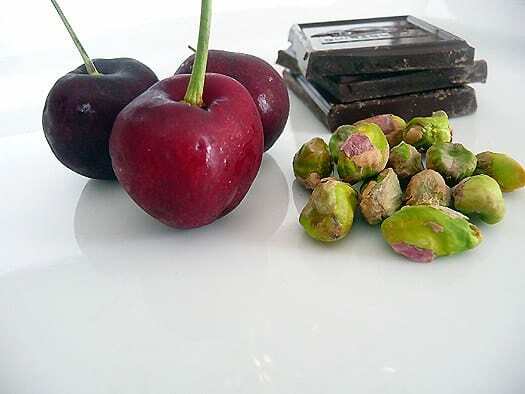 In mine I chose to use hazelnuts with the chocolate layer, left pistachio as-is, and after reading much about the cherry layer finally settled on maraschino cherries, pineapple and almonds. 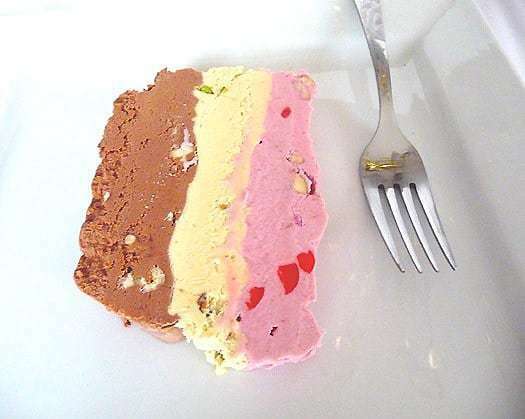 Traditionally, spumoni is made in a mold that results in a bomb-like dessert with the cherry layer in the center, followed by pistachio, and then covered by chocolate. Since I didn’t have a mold and wasn’t even able to find one online, I decided to go the terrine route and layer the flavors in a loaf pan, and then serve it in slices. This worked really well and since my ice cream bowl needs to freeze for at least 15 hours between batches, it gave each layer plenty of time to freeze before adding another one on top. The recipes below yield more than the 3 cups called for, but extra ice cream is never really a bad thing. As you can see, the edges of the slices aren’t perfect because it’s wrapped in plastic wrap. 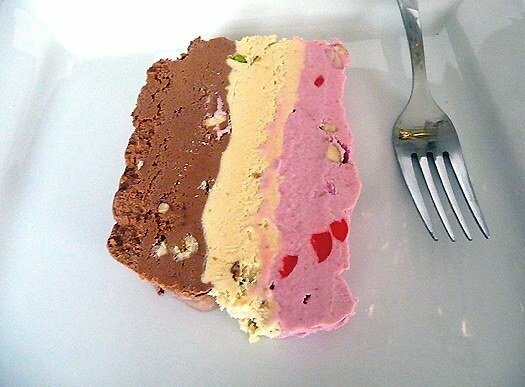 You could always trim the edges for a more perfect presentation, but you’d be wasting ice cream. And since when is an imperfect looking spoonful of ice cream anything but perfect? You will love this show stopping dessert! Line a large loaf pan or piece of tupperware with overlapping pieces of plastic wrap, leaving overhang on all edges. Spread 3 cups of softened chocolate ice cream into the bottom of the loaf pan, cover with plastic wrap, and freeze for about 30 minutes or until slightly hardened. Repeat with pistachio and cherry ice cream. Freeze entire loaf for at least 30 minutes. To serve, run a sharp knife under hot water, then wipe dry. Cut into slices. 1. To make the Chocolate Ice Cream: Warm 1 cup of the cream with the cocoa powder in a medium saucepan, whisking to thoroughly blend the cocoa. Bring to a boil, then reduce the heat and simmer at a very low boil for 30 seconds, whisking constantly. Remove from the heat and add the chopped chocolate, stirring until smooth. Then stir in the remaining 1 cup cream. Pour the mixture into a large bowl, scraping the saucepan as thoroughly as possible, and set a mesh strainer on top of the bowl. 4. Chill the mixture thoroughly in the refrigerator, then freeze it in your ice cream maker according to the manufacturer’s instructions. (If the cold mixture is too thick to pour into your machine, whisk it vigorously to thin it out.) Once churned, fold in the hazelnuts with a rubber spatula. 1. To make the Pistachio Ice Cream: Grind the 1 1/3 cups of pistachios in a food processor until finely ground, but not to a paste. Set aside. 5. Refrigerate until cold. Pour into an ice cream maker and freeze according to the manufacturer's directions. Once finished churning, fold in the ¾ cup pistachios with a rubber spatula. **You'll notice this pistachio isn't bright green like you find in stores. I didn't use any food coloring, so this is all natural, but you can add a couple drops of green food coloring if you're looking for a deeper green shade. 2. Strain mixture into a large bowl. Stir in the remaining 3/4 cup of heavy cream. Chill for several hours in the refrigerator until completely cold. Place the chopped maraschino cherries and pineapple chunks on a plate on a single layer and put in the freezer until ice cream is done churning. 3. Before putting the mixture into your ice cream maker, stir in the lemon juice and the Amaretto or other liqueur if you are using. 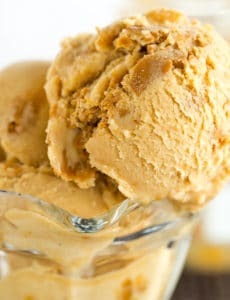 Note that you can skip the alcohol if you want, but the addition of it will help the ice cream from getting too icy, and the amaretto can add a nice flavor boost to the ice cream. Churn the ice cream in your ice cream maker according to the manufacturer's instructions. Once finished churning, stir in the cherries, pineapple and almonds with a rubber spatula. So this was amazing, and my New York born and bred Italian husband loved it. The only things he would have changed was to cut back on the nuts. I followed the recipe exactly except for adding Ghiradelli mini chocolate chips to the chocolate part. The chocolate was probably the best chocolate ice cream I’ve ever had, let alone made! Next time I would leave the nuts out of all of the layers except for the pistachio. Other than just a few too many nuts, this was simply amazing! Thank you for sharing! I’ve been looking at this recipe for several years, but it looked like a lot of work, and I didn’t have the time. But growing up in the Bronx, spumoni and tortoni were a real treat when we ate out, so I kept saying I was going to try it. I finally bit the bullet and made it, exactly as written. While spumoni might not sound very July 4th-like, it was perfect for our Independence Day cook out. The spumoni was three incredibly delicious ice creams. Unbelievable!! The best ice cream I have ever tasted. About nine hours work, but it was awesome. Truly unique. Thanks. Spumoni! Growing up in the SF Bay Area in the 50s, my family would buy it from an Italian restaurant-supply place for special occasions. Yummmm!!!! My mom made a version she called “The Ice Cream Bomb” or “Bombe,” and since she lacked the traditional molds she used nesting stainless steel mixing bowls, ending up with a single huge hemisphere. 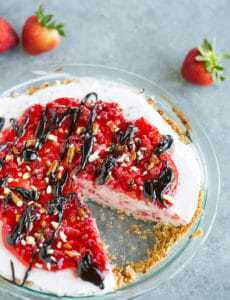 She added a different liqueur to each layer of ice cream mixed with whipped cream — vanilla with Tuaca (an Italian vanilla liqueur), strawberry with Curacao or Grand Marnier, and chocolate with Kahlua or a chocolate-min liqueur. Not true Spumoni, but still verrrrrry yummy. Oooh I love your mom’s version with liquor in each layer!